I recently had a discussion with a colleague about mentors. The subject came around to the person who provided a decisive and lasting impact on our career or life trajectory. I reflected on this in terms of my interest in public outreach and an applied approach to the study of archaeology and museums. So here is my mentor story . 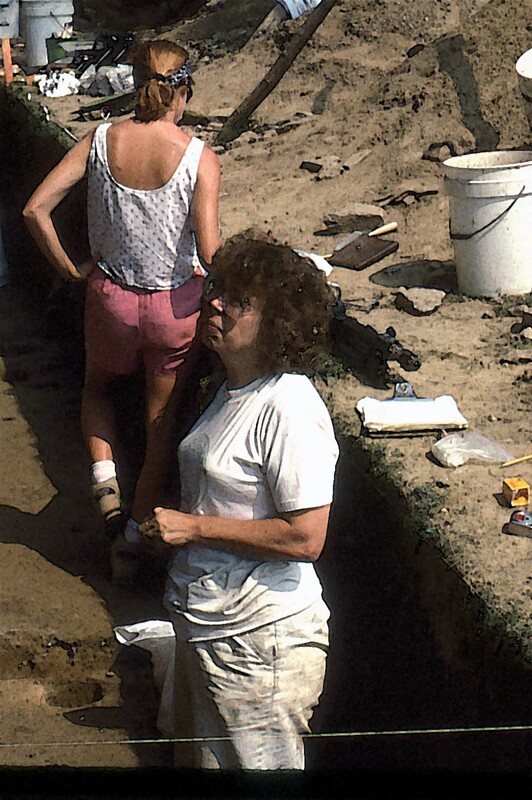 . . without a doubt, the person who most impressed me with the importance of the public role in archaeology was the late Dr. Patricia Sue Essenpreis. I first met Pat on June 21st 1987. I remember the date because it was at the summer solstice observation at the Fort Ancient State Memorial in Oregonia Ohio where I was to begin a field school in archaeology the following Tuesday. Before sunrise that morning, a group of perhaps 50 folks assembled to watch the sun come up, hopefully along the trajectory of two prehistoric parallel walls. I don’t remember the exact details of the sunrise event. I do remember that one fellow with his work boots painted silver and wearing some sort of aluminum contraption on his head held up a huge crystal as the sun rose and began chanting and dancing about. Pat took this all in stride and continued her presentation on the “canons of construction” used by Native Americans over 2000 years ago in building the earthwork complex. Ultimately, I took those basic concepts and over the course of my doctoral research developed what I termed an “architectural grammar” at Fort Ancient. Pat through long discussions provided me with the framework to develop my research interests. She was ridiculously patient with me as a nontraditional 30-something coming back to work on BA in Anthropology after accumulating an 0.7 GPA during my first try at college in the 1970s. She was committed to public participation in all aspects of the field work. I don’t recollect her ever turning away a volunteer or not answering a visitor’s question. Ten percent of our course grade in that field school was composed of how we interacted with visitors to the site excavations. In a pre-NAGPRA era, Pat was committed to collaboration and respect for the Native American whose ancestors built the earthwork complex at Fort Ancient where we now conducted research. Pat challenged us to think. Another 10 percent of our grade was to develop a real-time proposal for field research at another section of the Fort Ancient Earthwork complex based on what we learned over the six-week field school. Perhaps most important Pat consistently challenged us that if we could not articulate the importance of archaeology today as a contribution to real world issues, we might as well stay home. She noted that most archaeologists are funded through tax dollars in one form or the other and we needed to be able to explain why our research was a worthwhile expenditure of public resources. I don’t think Pat thought that “public archaeology” was such a big deal but more just a natural way of how things needed to be done. I am truly grateful to those lessons. Who mentored you about the importance of bringing archaeology to the public?